While you might not have a huge budget, there are a few ways you can improve your camp listing and get more parents to check out your camp! 1. An eye-catching logo: Having a simple, clear, relevant logo works best. 2. A video from your camp:show parents exactly how fun your camp is! They will be more convinced that their kids will be happy if you show them other kids in-action having a great time. 3. Use all your available picture slots! Just like the video, evidence of smiling faces gives parents the assurance they need to book with your camp. 4. Valid links: Make sure that all of the links to your site on your listing are working. If a parent can't access your site, they certainly can't sign their kids up to spend the summer with you. 5. Keep information updated: Having current information pricing, location, camp dates and likewise is important for the parents to make an easy, informed decision. The less they have to hunt for, the more satisfied they are and you also leave them with a positive impression of your camp. 6. Original Content: It is important for your listing to have text that differs from any other page. After Google released their Panda algorithm, all websites with duplicate content (textual information in verbatim) were effected unfavorably. Having differential and relevant content can improve your SEO (search engine optimization) for your listing and your webpage considerably, which can lead to better traffic. So be sure to add any unique, special events at your camp! 7. Lastly, double check all information is correct such as your location or activities. If your location or activities are misspelled or incorrect, you won't be able to reach those searching for camps with a specific location or activity in mind. Overall, have fun and be creative when making or updating your listing! It will translate positively to your viewers the more you enjoy yourself and are passionate. Happy camping, everyone! 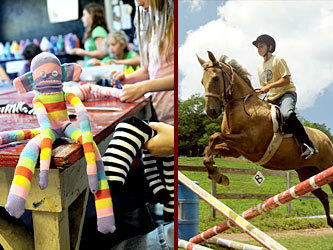 We all know what a fun, exciting, rewarding experience summer camp can be- even Hollywood can't ignore it! Movies about summer camp inspire us to reminisce about summers past, and also get us pumped up for summers to come. While some might be a little far-fetched, they all depict an experience that has become a rite of passage for all. 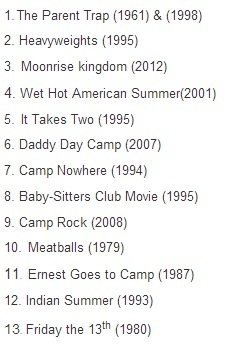 Check out this list of summer camp movies- can you find your favorite? Turn announcements into virtual events that create buzz and anticipation. For example, rather than simply creating a photo gallery on Facebook or Flickr, use Twitter to tease that you'll be unveiling the top photos from last summer and upload a new one each week. Tweet a link to the photo gallery each time you add a new photo. Countdown the days to camp by referencing activities campers can look forward to. Things like "168 days until dark chocolate S'mores around the campfire," or "Only 99 days until Color Wars 2011 commences!" Offer a behind-the-scenes glimpse into your camp prep by posting pictures of your planning activities during the year. Capture the state of your office right before sending out a mailer, take a picture of everyone poised to answer their phones, or show the progress of renovations underway to get camp ready for the season. Giving campers an insider's look at your enthusiasm will get them excited too. Announce when you'll be at a camp fair and invite people to visit you. Give Twitter and Facebook followers a secret code word to mention at your booth to receive a special prize or discount. Create mystery around the announcement of a new instructor or special guest for the coming season. Tweet hints and clues, inviting people to guess who you're talking about. Schedule an unveiling date and after a few weeks of anticipation, introduce your new guest to your campers. Hold contests to promote engagement with your Facebook page. Invite people to vote for the best photo of the season by clicking Like on their favorite photo. Run a caption contest for a camper-submitted photo. Or run giveaways by inviting people to comment or answer a fun question to enter.